As I was looking over my bookshelves recently, trying to find space for a new haul from the used book store, I lingered over my Wheel of Time collection . I have them in well-loved paperbacks and pristine hardbacks. Signed hardbacks mind you. You see, I used to be sort of obsessed. WoT was the first fantasy series I read. Oddly enough, it was introduced to me by my first boyfriend. Sure, I'd devoured a Wrinkle in Time, Animal Farm, and The Giver among others. But WoT opened a whole new world to me. I remember diving into The Eye of the World with skeptical glee. The complicated names and terms captured my imagination. I flipped to the glossary what felt like every other paragraph in an overeager attempt to understand it all. And the pronunciations! I tested the names and places out loud until I'm sure my parents thought I was learning odd spells. It felt daunting, and no reading experience prior to that moment had quite evoked that feeling. I was incredibly proud on the day I could say Aes Sedai with the best of them. Five books were published when I started WoT. I was expecting seven or eight books in the whole series, so every time a new title was released (every two or so years by that point) I celebrated by starting from the beginning. I went to signings and book by book got most of my collection signed by Robert Jordan. I lived on the message boards of wotmania.com (they closed their doors in 2009) and obsessed over theories. And then the books kept stretching out. I could no longer keep track of the millions of side plots without complicated notes. I stopped reading from the beginning when a new book came out, instead maybe reading some of the book before it. Those feelings of first love faded, and I had to let go. Then the unthinkable happened. 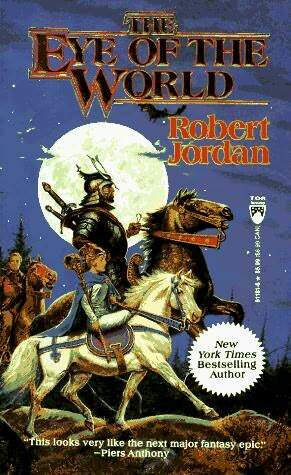 Robert Jordan passed away. His series is being finished by another, and when it is finally done I will pick the books up. It won't be the same though. Nothing compares to those first feelings of falling in love. 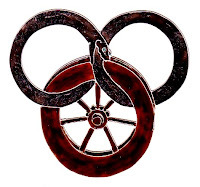 Me and the Wheel of Time just weren't meant to last, but it will always have a special place in my heart. Obviously, I mean, the collection does take up two shelves. I did learn a lesson, as one does with heartbreak or letting go. I avoid unfinished series whenever I can; I'm just too damn impatient. Which fantasy or sci-fi series did you pick up first? Do you still read it? Feel free to comment here or over at my Facebook page. I can't remember which I started reading first. It was either the Foundation series by Asimov (from my Dads bookshelf) or Terry Pratchett's Discworld. I have read all the Asimov at least twice now. Another favourite that came later was the Ender series by Orson Scott Card. Douglas Adams Hitchhiker's stuff. LOVE IT. Read the trilogy the first time when I was 9 and then read it about once a year for seven years. Since then have read it about every five years or so. Humor, I always go for the humor... Other favorite series have included Edding's Belgariad, Dexter's War Horse of Esdragon, Roberson's Tiger and Del, and of course Tolkien (there's always room for Tolkien). Have also read more than my fair share of Star Trek and Star Wars books. The first fantasy series that I can remember reading all the way through was Lord of the Rings at approximately the age of 11. (Way to start off with the heavy hitters, right?) That was followed very quickly by Timothy Zahn's restart of the Star Wars fiction with "Heir to the Empire" and then George Lucas' follow up series to "Willow". Fond memories of good books. Matt - See, this post is secretly a way for me to get book recs. Though of course, I'm sure I could just ask. The Ender series is definitely on my list. So many books to read! Sue - It's so easy to tear through Star Trek and Star Wars books I've found. :) I finally read LotR and now I listen to it more than I read the actual books. I still need to read Adams and several others on your list! Hobbit - Given your user name, I would expect no less. That is quite ambitious for an 11 year old I must say. I enjoyed it, but still floundered through in my twenties. There's a book series based on Willow?? How did I not know this? What a delightful find. I thank-you for your entry on Fantasy Maps. I too love maps, my geography skills are great though and I love to sit and talk with old people in any area I live and learn stories of the old factories, hills, houses and events. It is like the best of fantasy but without the unwordly characters. Unless an Albino Navajo I met in Oljato counts. This entry has also caught my I and I think I will begin to follow your blog. My first series was Narnia and I am surprised it is not mirrored in others entries here. I have read most of Eddings Work, Most of Tolkiens including the Silmarillion, a beautiful work full of delightful background to the LoTR. I have read Brooks, and the WoT. I have delved into Asimov, never into Star Wars or Star Trek. I have read two of the Hitchhiker Guide Series and fondly enjoy listening to the Old BBC radio broadcasts. I have also read extensively on the history of Alexander the Great, the Persians and the Khans.